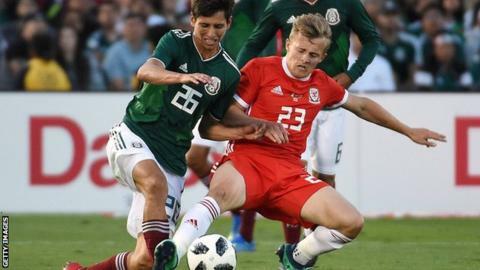 Wales kept alive their slim hopes of qualifying for the 2019 Euro U21s Championships as they beat battling Liechtenstein in Bangor. George Thomas hit the target twice in the first half against their winless opponents. But the hosts struggled to impose themselves as the game wore on and Liechtenstein took advantage. Lukas Graber curled in a shot 12 minutes from the end, only their second goal of the campaign. Neither team moved in the table, Wales staying fourth with Liechtenstein bottom and two places below them. The group winners qualify automatically for next summer's finals in Italy and San Marino, while the runners-up advance to the play-offs if they are one of the four best runners-up among all nine groups. Wales face Portugal, also at Bangor, on Tuesday, 11 September. "It went from half time where we were thinking let's continue the second half how we finished the first and go and get the third and fourth goal. "And then we conceded a sloppy goal and they hit the crossbar in the 93rd minute . "There were aspects I was really pleased with and other areas we need to learn from. "We've created chance after chance and need to be clinical."